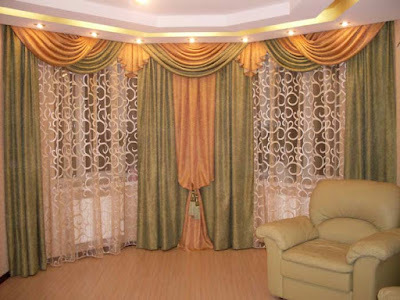 In the modern interior of the living room, curtains are not only functional, closing the room from sunlight and curious eyes, but also an important element in its design. curtains 2019 perform a very difficult mission to become a link between all elements of the interior, sometimes belonging to different styles. 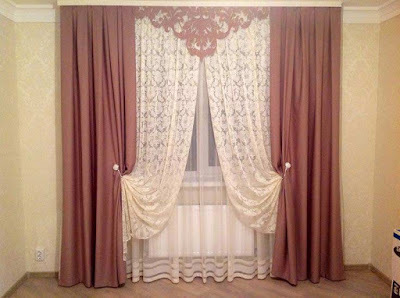 That's about solving this problem, about styles and decor elements of curtains, this year you will learn about fashion in the article. 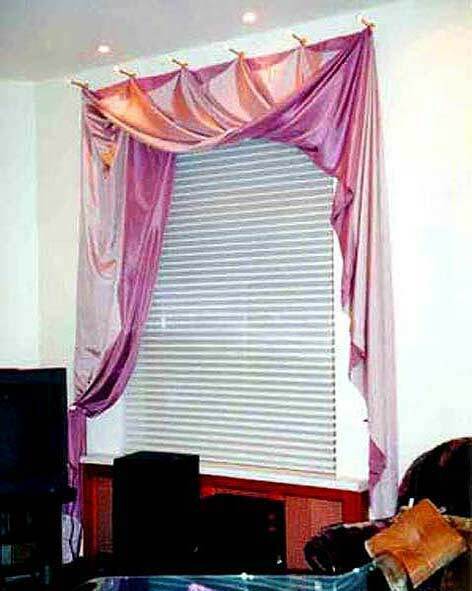 And also see the master class for making curtains with your own. 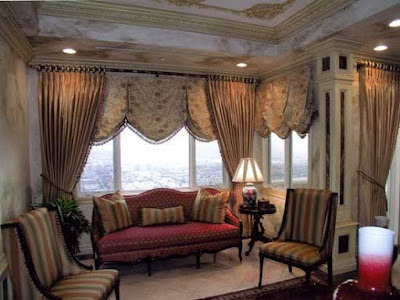 The final touch in the curtain designs for living room, like any other interior, will be curtains. Of course, they must match the style of the room, make it more cozy and beautiful. 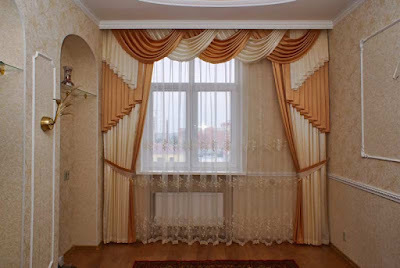 Each style corresponds to a certain type of curtains 2019 and should be guided in this so that unsuccessfully selected curtains do not "fall out" from the general picture of the living room design. The modern style of the interior is a mix of other styles: high-tech, minimalism, eclecticism. It is a way of expressing oneself, showing one's individuality, taste and perception of comfort. The main features of modern style - ease in perception, light colors, ease of use. 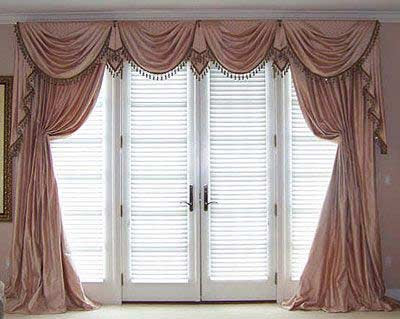 Curtains in the modern style are usually straight, without stitches, on hinges or eyelets. 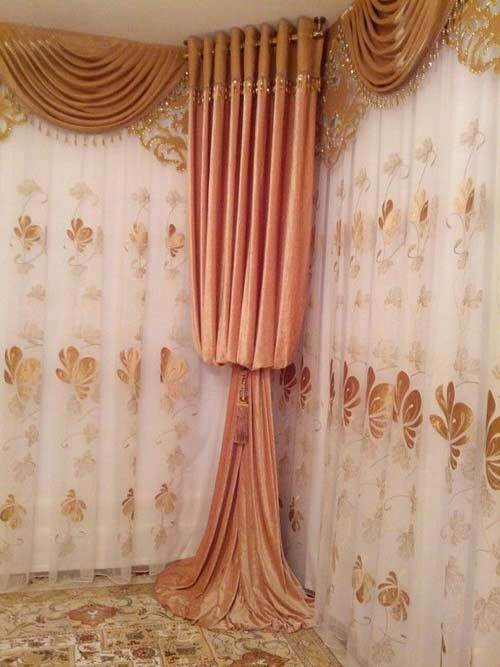 The color scheme of curtain designs 2019 can be consonant with other colors of the interior but must be light: beige, coffee with milk, ivory. Or accent: red, purple, blue, green. But be sure these colors should be clean, fresh. Fabric for curtains in a modern style fits any: from natural with a pronounced texture to manufactured with the use of modern technologies: metalized threads, laser cutting. Picture: plain or geometry. Classics will never go out of fashion. Interior in the classical style will always be popular, besides the indicator of the excellent taste of its owners. 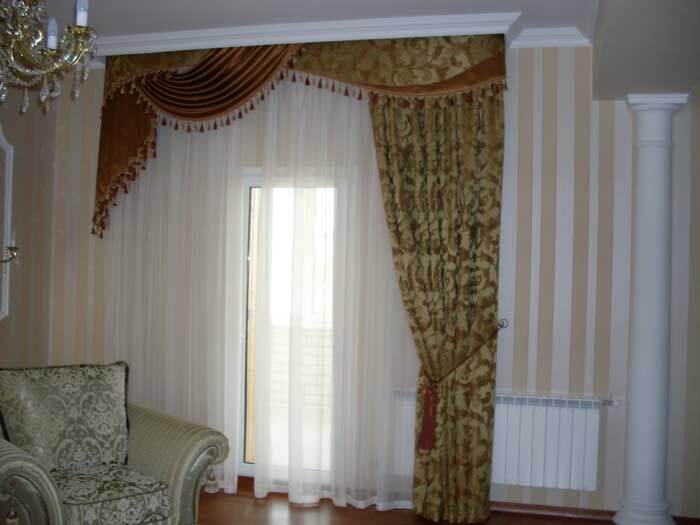 curtain ideas 2019 in the classical style are a combination of heavy opaque fabrics with an airy organza. They are very functional: lightweight fabric does not interfere with the penetration of sunlight into the room, and opaque curtains can hide it from excess sun and prying eyes. 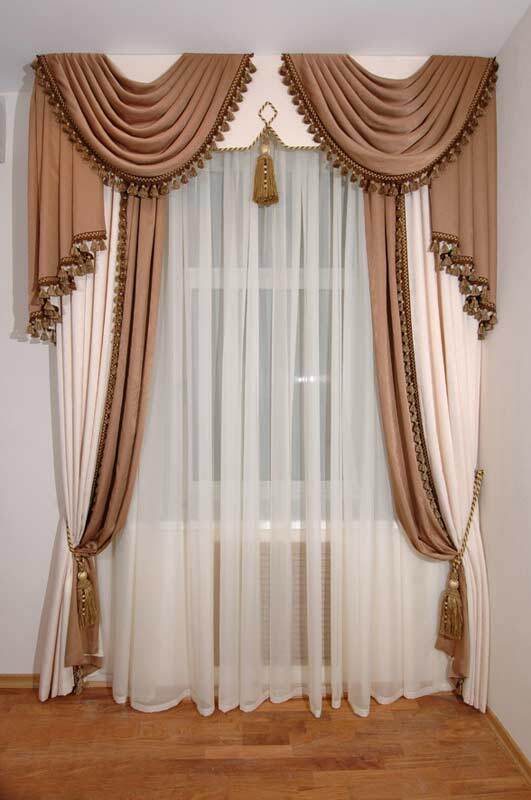 The classical style allows the use in the manufacture of curtains of all types of fabrics, and texture and pattern, using all sorts of decor elements: lambrequins, braids, cords. 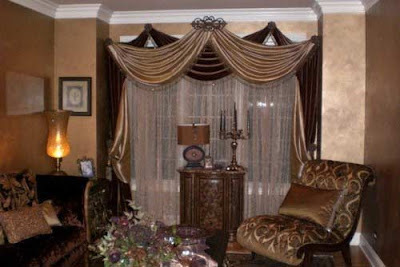 In this style, it is important to withstand the color range and texture of the curtains, consonant with the interior. 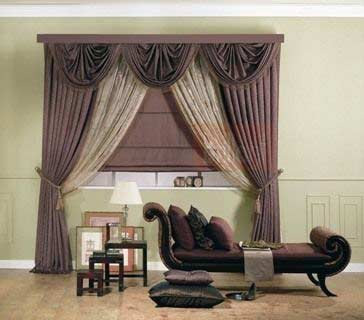 Otherwise, it will be scattered and unattractive, because in the classics curtains 2019 are the main accent element of the interior. Style hi-tech is a tribute to the modern way of life in the age of industrial progress. In the interior, made in the style of high-tech there is nothing superfluous, each thing has its place and purpose. This rather cool and unpretentious style, originally intended for office space, is gaining more and more fans who use it in residential areas. 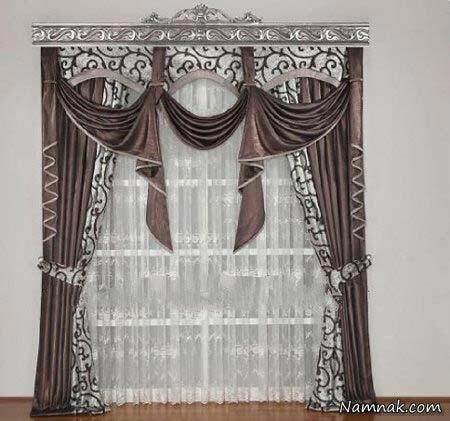 Window decoration in the style of high-tech carries only a functional load, no decor. Strict and simple, curtains should be transparent, have a metallic luster. 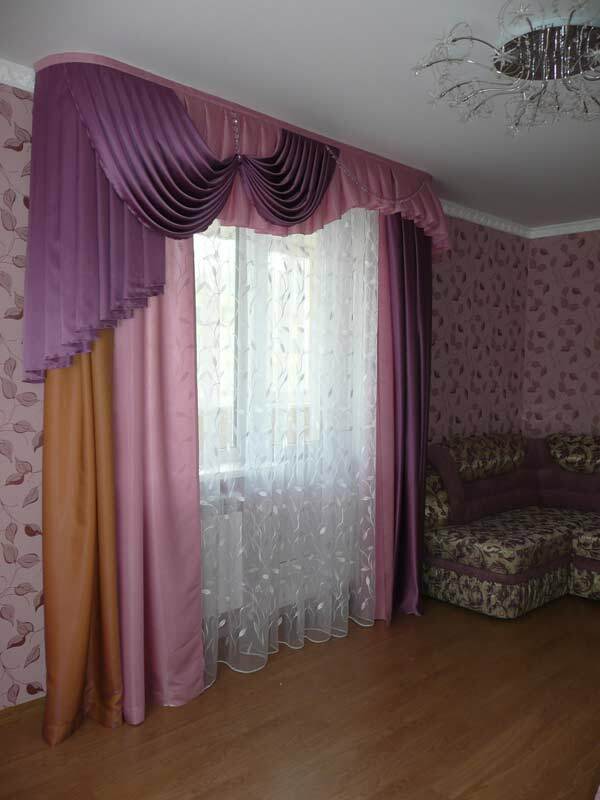 Such curtains 2019 will be appropriate only in the interior of the high-tech style. 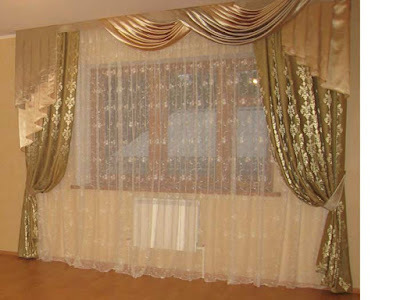 In sewing curtains, the choice of fabric is very important. It should be the most modern and high-quality material, possibly with a metal thread or laser punching. The color scheme is appropriate: the color of the metal, from gray to gold and platinum. Style Provence brings us closer to nature, it's more like a country style with an amendment to France. After all, he was named because of its southern province. Style reflects rural life, which means modesty and simplicity in everything. 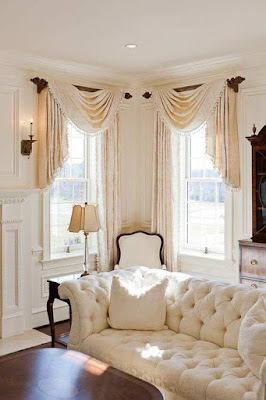 These are natural materials in interior elements, wooden floors, and ceilings, curtain designs 2019 of simple cut to the whole window. 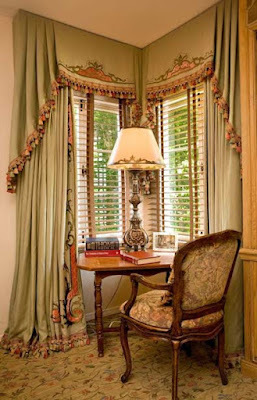 By the way - in the classic style of Provence the window should be from ceiling to floor. Unusual drawings on curtains - these are flowers or bouquets of various sizes and motley, red-white-and blue-white cage, strip. Fabrics - linen, printed cotton, embroidered or crocheted linen. 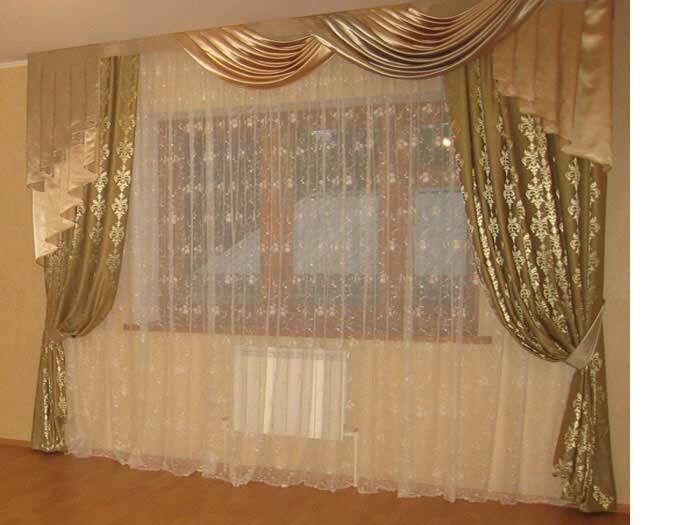 Curtains in a minimalist style, like in high-tech - it's only a functional element of the interior. No decorations, clarity of lines and brevity - that's their distinctive feature. Therefore, the choice of tissue should be approached responsibly. The fabric should be light, monophonic, maximally transmitting light from large windows. Fashion for Eastern culture came to Europe for a long time. It completely changed our idea of the functional content of the house. Light, stylistically finished, Japanese minimalism is appropriate in any room. Japanese curtains, so-called panels, are applicable not only in the oriental style, they are appropriate in combination with minimalism, high-tech, eclecticism. In addition to their direct designation of window decoration, they are often used for zoning space. Due to the peculiarities of its design, Japanese curtains can hide the room from unwanted eyes while at the same time letting sunlight from outside. Successfully matched the texture and color of the fabric can visually increase the space. After all, most of the material that is used to make similar curtain designs 2019, has a light-reflecting effect that, when applied on curtains 2019, is able to visually move the walls or raise the ceiling. Japanese curtains designs - this is not a single whole canvas. They consist of many rectangular canvases, which is very convenient if you need to partially update the curtains or change one of them due to damage or grazing. This is the only type of curtains, with which you can constantly change the interior, differently pushing the canvas and changing them. Fabric and pattern for curtains in the Japanese style depends only on the imagination and taste of the owner of the living room, in which they will be. The style of eclecticism is a combination of incongruous, dissimilar in style and opposite in sense of interior elements, dropping out of a conventional stylistic union. A very interesting style for creative people who want to show their individuality and taste their taste. After all, at the seemingly simple simplicity of filling the room in eclectic style, there are still a few rules, so that the randomness is only apparent, and the incompatibility of the parts is ideally harmonious. Otherwise, you are doomed to the fact that your eclecticism will turn into kitsch. 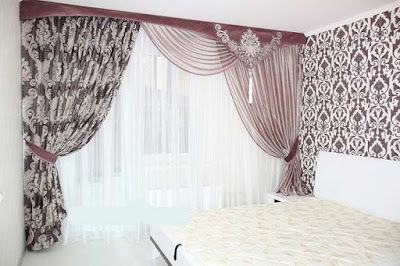 Otherwise, there are no restrictions in choosing the quality of the fabric, the color palette, the pattern, the elements and the amount of decor for the curtains. 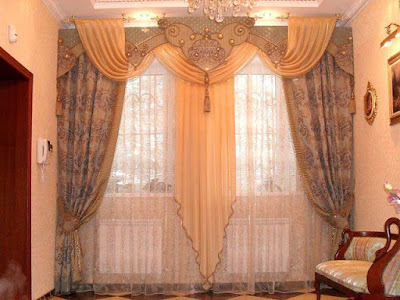 In the decoration of curtain designs for the living room in the style of eclectic, it is possible to use not only the generally accepted elements, often used in their tailoring but also completely unexpected. It can be feathers, ribbons, Beads, pebbles and lace, dried and artificial flowers. The flight of imagination has no limit and that is especially pleasant - the decor can be changed constantly, periodically realizing your fantasies. A new style, which appeared quite recently, but long awaited. After all, our ancestors had a lot of high-quality and good-quality things, which with such pleasure we are copying and using in our lives today. The name of the style came to us from France, where so-called expensive wines of excellent quality, cooked in the most successful year for winemaking. Designers are very cleverly done, giving this word its meaning. All the most fashionable, stylish, taken from the past - this is vintage. 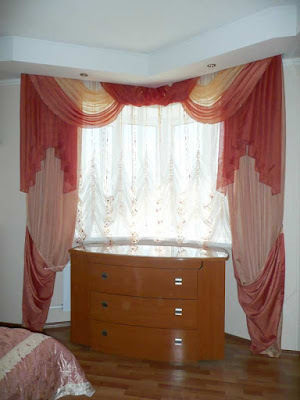 But this does not mean that you really need to get from the old chests a dusty and sunburned fabric for curtains. From there you need to get the idea for them, and the fabric can be picked up by the modern one. 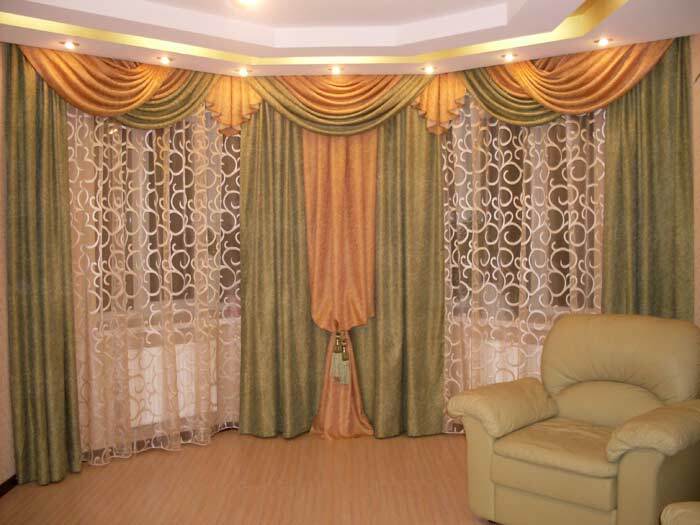 The idea is that in our modern interior, sometimes cold and uncomfortable, together with the vintage living room curtains will come warmth and harmony. To create curtains you can take brocade, dense silk, satin, velvet, tulle with dense gold embroidery - the fabrics should be flowing and heavy. Picture printed, jacquard or goblin. For the decor, braid, fringe, brushes, pompons will suit. When using fabrics with all kinds of patterns, it should be noted that in the vintage style it should be in tune with the general background. In addition, there is a strict rule: the more drawings on curtain fabrics - the fewer decor elements on them. A multilayered curtain is possible, differing in density and transparency of the tissues. the fabric on all windows should be identical. Not allowed fabric with the same pattern, but different in quality and texture. 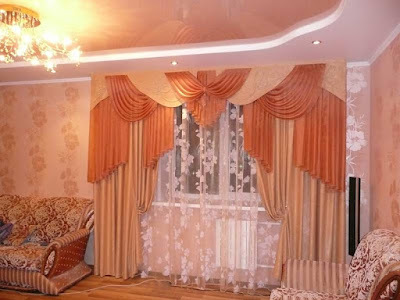 The cornices must be made of one material. Do not assume the approximate color of each of them - only the same. 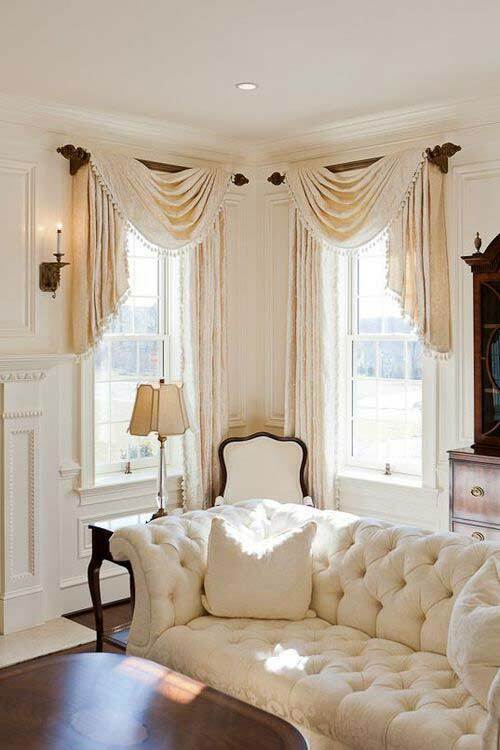 The way the curtains are fastened to the cornice is the same on each window. 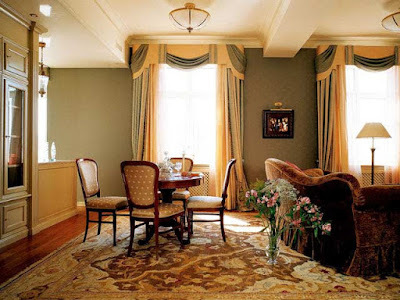 if the windows are located side by side on the same wall - a more interesting variant of their decoration is to create a central part of the curtains in the middle of the wall, rather than each window separately. with the separate design of each window, the curtains should look like twin brothers: ideally the same in every detail and decor elements. The correct choice of curtains for the two windows of the living room is also that they are harmonious in space, sometimes too small for two windows, do not dominate the rest of the interior with their decor and pomposity. Ideal - curtains in the classic, Japanese style. jalousie. Ideally, solve the problem. The most practical, but create the impression of an office space. 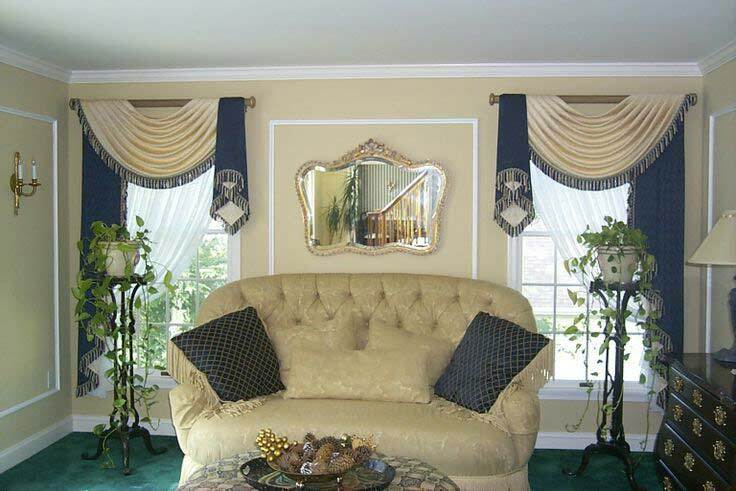 Even trumped up in color does not give the living room a homey feel. sliding curtains. The balcony is always next to the window and is decorated with it. 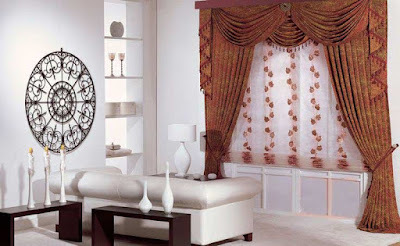 Conventional straight curtains designs and ideas on hinges or eyelets easily move, drape and do not deform due to the features of the fastening. Lifting oriental curtains are good because you can zone them to use. After all, for the balcony and the window, there is always a system of curtains. Select curtains for the living room with a balcony there. The main thing is to take into account the style of the interior and try not to hang classical curtains 2019 in the room in the style of high-tech, even if they seem the most convenient option with frequent use of the balcony. Lamb rack is a decorative element that is in front of the curtain and is used to hide the eaves. But in addition to this function, lambrequins successfully cope with the mission of visual raising ceilings, changing the proportions of windows. Lamb rack can be soft and hard. Soft is sewn directly to the curtain designs 2019 and serves only as a decorative element. But the hard, attached to the wall above the cornice, hides it and adjusts the size of the window. For the manufacture of lambrequins suitable for any fabric, except for delicate. Often for the production of lambrequins, a fabric for living room curtains of the identical structure is used, but different in color. Hard lambrequin can be used in any style of interior, even in high-tech, printing on it with a picture suitable for this style. A soft lambrequin is more suitable for styles of a romantic or classic character. Despite the fact that most people prefer to decorate the living room with curtains with lambrequin, there are still supporters of minimalism in everything, even in decor. In addition, now there is such a variety of beautiful modern eaves, which are a self-sufficient element of decor, that they can not be hidden behind hard lambrequins. And if the fabric for living room curtains is gorgeous, attracts attention, then lambrequin can be an excess. Especially with high ceilings and proportional windows, its visual functions are not needed. Most often in the interior design of the living room, long curtains 2019 are used. 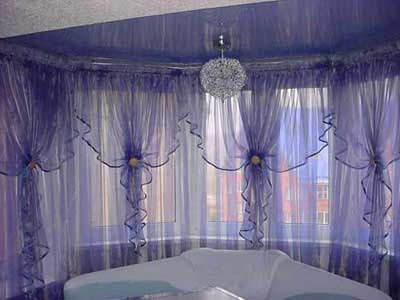 And many styles require the length of the curtains to the floor. located on the wall, visually expand the space, creating the impression of a large and bright room. 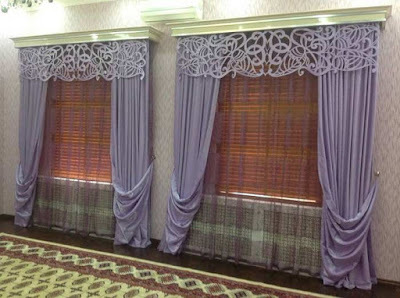 If for some reason, long curtains cannot be used: furniture is too close to the window, the windowsills serve as a table, heating batteries under the window, then it is acceptable to use short curtains. 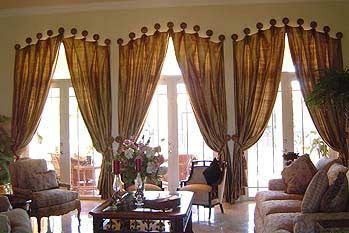 But still, most often short curtains are used in the kitchen interior. The eyelets have recently appeared in the design of curtains, but have already been appreciated. The eyelet is a metal or plastic ring that is inserted into the fabric and through it is passed through the cornice. 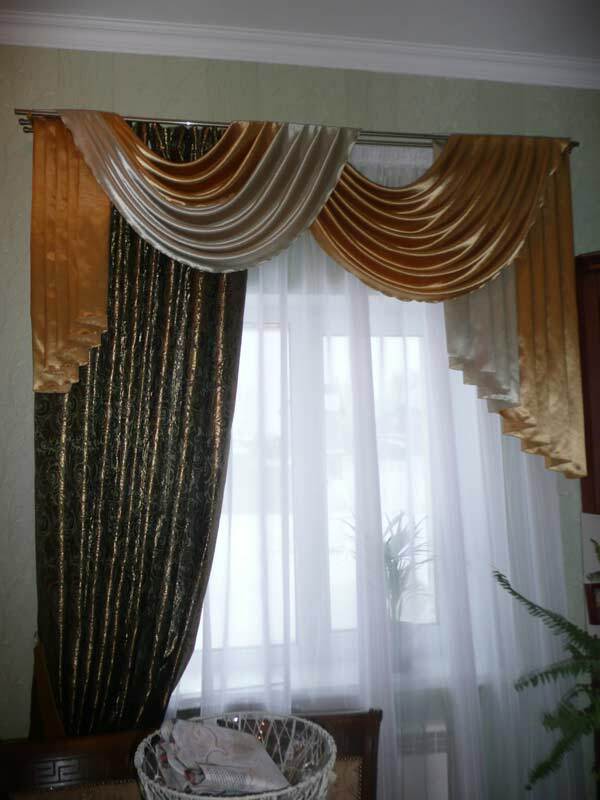 curtain ideas 2019 with eyelets are very airy and elegantly look on the cornices because these rings are completely invisible, it seems that the curtain is flowing in the air with neat folds. 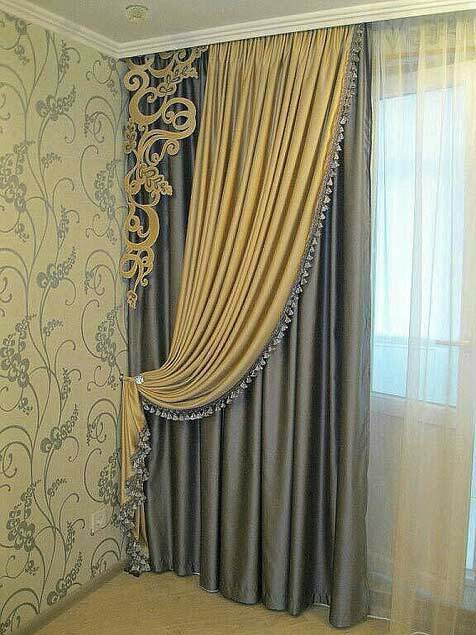 This kind of fastening of curtains is universal, suitable for all styles, for any rooms. 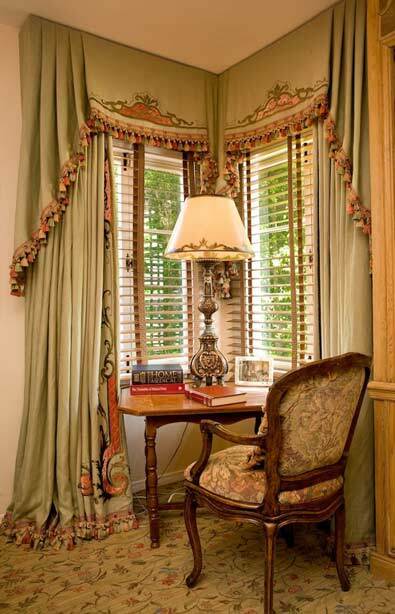 Virtually any fabric can be used for sewing curtains with eyelets. The eraser, the protrusion in the wall, is not only fashionable but also very practical. Such architectural design allows the owner of an apartment with a bay window to get extra meters at his disposal. 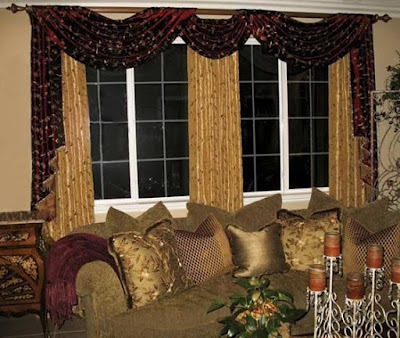 In addition, the bay window expands the space of the room visually. 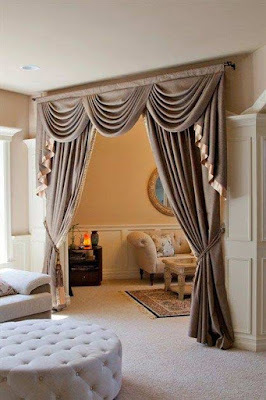 Decorate such space curtains 2019 can be to your liking, adhering to the style in the entire living room. 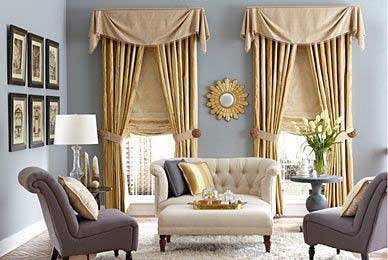 It is important only to take into account the shape of the bay window so that the curtains blend harmoniously with it. 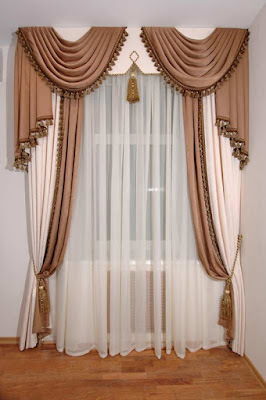 If the bay window is trapezoidal, the curtains 2019 should be sewn separately for each window in it. 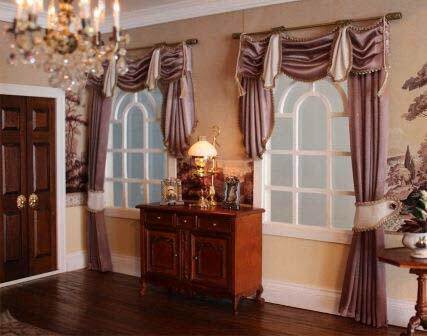 For a semicircular architectural form, one curtain on the cornice, which matches the radius of the bay window, is suitable. If under the windows of the bay window there are heating batteries, you can hang short curtains in it to maximize the use of heat. Curtains made of natural fabrics: cotton, linen.